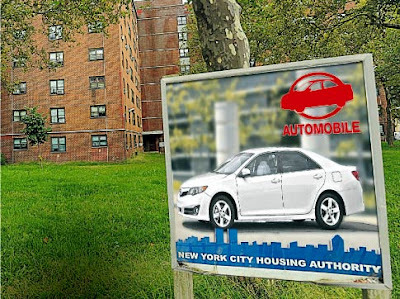 The Daily News is reporting that the NY Housing Authority is debating selling advertising rights at some 338 developments across the 5 boroughs. Clearly this is a terrible idea which will result in booze and fast food ads targeted at low income families which will help perpetuate bad habits for families which already face immense hurdles. Advertisers are notorious for drowning low income neighborhoods in advertising for products which perpetuate violence and an unhealthy lifestyle. This is nothing new. What I did find interesting are a few quotes from people interviewed for the article who speak about the ads on housing developments specifically but whose comments resonate on outdoor advertising in general. "The plan drew outrage from lawmakers and experts who worry advertisers would prey on the projects' low-income residents." While I think advertising on housing authority property is a terrible idea, does advertising on or city streets not do the exact same thing to the whole of the city? prey on the residents of our city? VIA NY Daily News The cash-strapped city Housing Authority is considering raking in bucks by selling ads on its buildings - and it could even mean billboards for booze and fast food.